When former jockey Jacklyn Wyatt used to exercise “Jobber Bill,” she loved to tease his trainer about letting her take him home to be her show horse. Four years later, that dream has finally come true. Jacklyn “Jackie” Wyatt fell in love the same way many of us did: her grandparents gave her a gift certificate for a riding lesson at a neighborhood farm in Ontario when she was young, and she got hooked on horses from the first moment. Years of equitation training took her into the hunter ring for a few seasons before her parents purchased her first horse “Martin,” known as Hershey Kiss. Wyatt and Hershey Kiss competing in the jumpers. Photo courtesy of Jacklyn Wyatt. Intrigued by the racing world, Wyatt found her first job at the track through Sandy Hawley, starting at Woodbine in Toronto as a hot walker. From there, she worked up the ranks to become a jockey, taking on more and more responsibilities as she gained experience. Training. Photo courtesy of Jacklyn Wyatt. It wasn’t an easy lifestyle, but Wyatt managed to keep all the plates spinning at once. Some of her daily training rides were paid, offsetting her limited income from the races she was riding; other morning rides were unpaid but taken with the intention of hopefully getting the mount in the afternoon in the races. Sometimes, Wyatt would race early in the card at Fort Erie Racetrack, an hour and a half away — she’d have to cut her mornings short so she could make it on time. If she were racing at Woodbine, she went through the form for the day, ride her races and then occasionally visit with the trainers afterwards before heading home to do it all over again the next day. In the last quarter of the 2012 season, she was also one of two “room riders,” who were paid to wait around from the first race on the card to the last in the event a rider booked off a mount. “Some riders tended to book off their mounts in colder weather,” Wyatt adds. Jobber Bill as a three-year-old, snoozing in his stall at the track. Photo by Jacklyn Wyatt. A chestnut gelding by Saffir out of a Dr Carter mare, Healing Touch, Jobber Bill won two of his 34 starts, earning just over $78,000. The last few years of his career, the horse ran mostly at Fort Erie in low-level claiming sprints. “He only ran once as a two-year-old and he showed some promise as a three-year-old but it never seemed to translate in the afternoon.” While he couldn’t necessarily find the wire first, Jobber Bill did finish second in 12 of his career start. Wyatt left the track herself in mid-2013, switching careers to work as a security engineer in e-commerce retail. In the summer of 2016, she finally found herself in a position to own a horse for pleasure again, having been out of the saddle for three years and without a horse of her own for much longer. 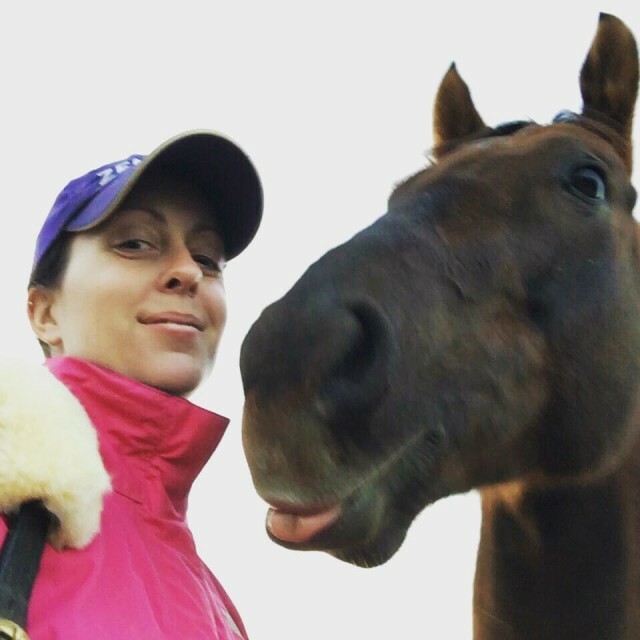 “I have known for years that, given the opportunity to do so, I would give an OTTB a new lease on life. I thought it would be fantastic if I could reconnect with a horse I used to ride, and Jobber was the first one to come to mind.” She tracked the then-seven-year-old horse down, contacted his trainer Steve Cathcart and shared her story. “Steve talked to the owners and they agreed that they would love to see him go to a loving home when he retired that year. He raced a few more times into the fall of 2016, and in mid-October I received the phone call to say that they were retiring him and I could come pick him up any time!” A few days later, Wyatt and her barn owner picked up Jobber at Fort Erie and took him home, where he transitioned into being part of the herd, eating plenty of grass and just being a horse. Wyatt’s long-time dream had become a reality, with one of her favorite horses finding his forever home under her care. One of the first rides off the track — for both Wyatt and Jobber! Photo courtesy of Jacklyn Wyatt. After some well-deserved let-down time, Wyatt started riding Jobber late in 2016 with a big focus on the basics, both to get herself riding fit and to teach Jobber the fundamentals. “My main goal is to get back into competing in the jumper ring. I really miss it and I think Jobber would do quite well at it! He’s incredibly eager to please and picks things up very quickly. He’s very level-headed, brave and trusting. Wyatt and Jobber Bill cheesin’. Photo by Jacklyn Wyatt.